Branson CPX8800H 5.5 Gal. 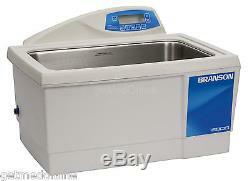 Heated Benchtop Ultrasonic Cleaner w/99 Minute Digital Timer, CPX-952-818R Brand New Item. 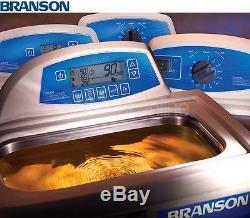 Bransonic CPXH heated ultrasonic baths are the most technologically advanced ultrasonic baths available. With programmable features, digital operation with power tracking capabilities to adjust for light or heavy loads, high/low power control, degassing and sleep mode, the CPXH is the most versatile system available. Degassing and conditioning the solution: The CPXH degassing period can be set up to 99 minutes. Extended degas time periods allow for beyond cleaning applications such as sample preparation, which includes degassing liquids, mixing and homogenization, dissolving solids, cell lysing, and dispersion of particles. Ultrasonic power tracking: The new CPXH Series Bransonic control circuitry actively tracks the operating frequency of the bath and immediately brings the tanks frequency back to its optimum point. What this means to the end user is that the CPXH Series Bransonic bath will always deliver the same ultrasonic power without depending on the operator to make adjustments. The new CPXH Series Bransonic delivers unwavering cavitation, steady activity in the bath, even when the load conditions change. Programmable: The CPXH Series is completely programmable. Once the process is entered into the controller, the end user only has to start the program and they are free to leave the unit on its own to do the job. The programmable process allows the process engineer to choose the temperature set point at which the degassing and ultrasonic time periods are triggered to begin. Once the CPXH ultrasonic run time period is reached, the unit shuts off, delivering the same results every time. Automatic ultrasonic activation: When the process temperature reaches the programmable set point, the ultrasonic cycle begins. This includes selectable times for both degas and ultrasonic processing. High/low power control: When cleaning delicate parts, the CPXH allows the user to lower the amplitude of the acoustic energy in the bath: 100% power to the tank for normal applications, 70% power for delicate applications. Manipulating the output waveform in this manner greatly helps to avoid damage to the components in the bath during the ultrasonic process. Sleep mode: An energy-saving green feature. When the cycle is complete and no control keys are touched for 15 minutes, the CPXH unit goes into sleep mode. Touching any key on the controller causes the unit to come back on. High-temp safety alarm indicator for protection from unit overheating Temperature calibration is user accessible through front panel. Controls are located above and behind the cleaning tank in an easily accessible control tower panel, and raised above the tank to avoid damage from cleaning solutions. Convenient built-in pour drains are featured on. Tank drains with valves are incorporated on models 1.5-gallon and larger. For optimum cleaning results, Branson offers a line of accessories including perforated trays, solid trays, beaker covers and support racks for your application needs. Sweep frequency eliminates standing waves and creates consistent cavitation throughout the tank. 40 kHz rugged industrial transducers. 99-minute digital timer and continuous ultrasonic operation. 6.5" x 5.5" x 4. Non-heated, 60 Minute Mechanical Timer. Heated, 60 Minute Mechanical Timer. 99 Min Digital Timer, power tracking, degas. Power control, sleep mode, programmable. 9.5" x 5.5" x 4. 11.5" x 6" x 6. 11.5" x 9.5" x 6. 19.5" x 11.5" x 6. Please send us a message for pricing on the 220-230V models. Lead time may go up to 3 weeks. 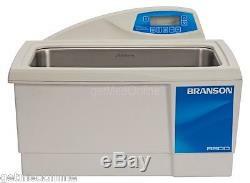 The item "Branson CPX8800H 21 Liter Digital Heated Ultrasonic Cleaner, CPX-952-818R" is in sale since Wednesday, August 06, 2014. This item is in the category "Business & Industrial\Healthcare, Lab & Life Science\Lab Equipment\Cleaning Equipment".